Great post. I’m not a lefty but I have friends who are. Great site, I hope to read more from you. I won’t be on the old forum anymore, since one of the other mods felt it necessary to remove me. The old story of “Do as I say, not as I do”. At any rate, left-handers should stick together for the benefit of all of us. thanks for your kind words. I have remonstrated with the mods about your removal. Not sure that will achieve anything, but I do believe they were too heavy-handed this time. Well, I don’t want to rehash the details on a public blog, but I will say the one thing that annoyed me was my apology somehow got deleted, which seems to have been done out of spite to cast me in a bad light. Still, onwards and upwards. 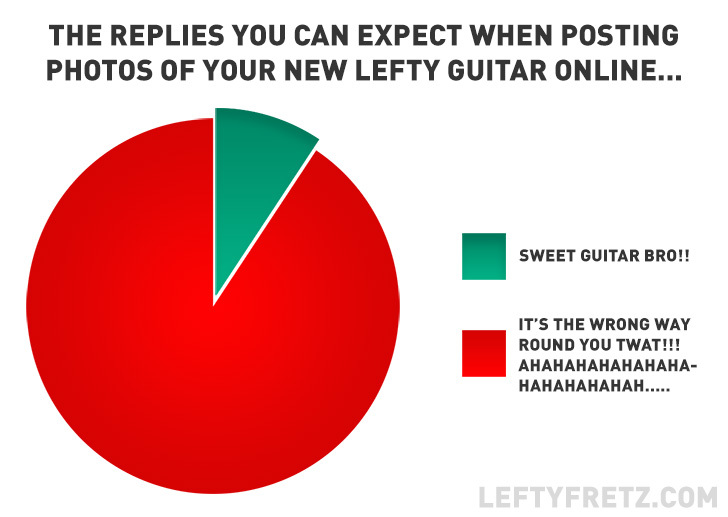 I’d like to suggest Leftyfrets.net (which is not the same as Neal’s excellent site). It’s primarily older Americans w/acoustics, but does have some interesting articles about left-handedness. That encephalotomy.com post was fascinating. Great stuff! Thanks 🙂 That guy is good.